As I am known to do at times the day has come to visit and tell you about one of the oldest establishments on the Great Lakes Shard, today we will visit Compassion Desert and the Temple of Mondain. The wind is rough this day and the sandstorm almost blinding me as I make my way south one horseback from the guard outpost in which I spent the morning playing dice with its inhabitants. The storm blew harder and I found myself being pounded by the ferociousness of it, to my surprise a Sand Vortex had materialized and thought it would feast on my dog and myself. Pinky had another idea as she allowed me to dismount before making sandcastles of the vortex and the Harpies and Orcs on its heel after returning dutifully I tossed her an apple and we rode on to the keep. A Huge Stone man stood high above us announcing this as the Temple of Mondain Spear in one hand with an outstretched palm warning those who entered, was the message take heed? Or do not pass? The latter was out of the question as we were most certainly going in, after all if he could not relieve himself of the pigeon droppings he most certainly held no earthly powers at this time. The inner chamber was unnaturally warm; as I looked upon four black pedestals surrounding an arcane circle atop each one lay a different colored skull. Benches faced the west wall and a throne sat directly at the circles edge overseeing the altar of sorts and ready to seat the one who would take charge of the ceremony. The room was lit only by two braziers on each side of the seat and flames danced on the dark walls and ceiling throughout the chamber. The power emanating from the circle was too much to ignore, I strode forward and stepped into it as the world swam and came back into focus or a semblance thereof. Rain pelted the sand and a sudden flash of light illuminated the clouded black of a moonless sky. The thunder moved the very ground as it roared across the sky. Members of the temple were gathered within taking seats made of old wood in the main chamber. 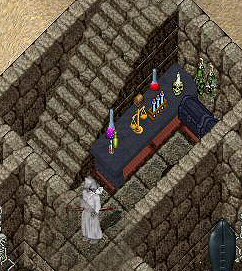 As the Black Altar shown as the center piece and, as they had a hundred times before, the great skulls upon each of the Black Altars pillars glowed hues of red, green, white, and blue. And as before there was a sacrifice to be made, but this night would not be anything like before. Two figures came down the stairs, each holding the arm of what was to become another sacrifice, a soul to devour and grow even stronger. She seemed almost too weak to stand, though eager for the known outcome. Her face was without hope and seemed to welcome the coming death that almost assuredly awaited her. A dark figure seemed to float down the stairs; one person spoke the name poet, which elicited only a cold stare as the newcomer stared only at one thing… The green glowing ring on his right hand. The Ritual had begun…… The few remaining members of the now declining temple began to chant as Poet began to cast the soul claiming ceremony that would lead him to immortality. The ground beneath them began to shake as the altar began to vibrate with a low-pitched hum that resonated from each of the four pillars. The torches that lit the room blew out and only the green glow of the gem lit the room. Trying to brace themselves the ones called Durnik and Legato fell back against the walls behind them, their faces now in a state of worry as the temple began to shake as if the gods themselves were trying to lift it from its very foundations. Massive light, resounding crashes, dust stone flying everywhere and then there was nothing but the weight of the world that had come crashing down around them. There was a gaping hole through the stone roof that tore through both levels of the temple. The very foundation was cracked and crumbling beneath their feet. There was a circular spread of debris from where the black altar once stood, its pillars broken and strewn outwardly. Then I was back in the present and the vision seemed like a dream I had once had more then an experience just moments old, images already began to fade as I put quill to parchment to retain what you see here. Some thing tore this place asunder at one point but it was certainly looking rather fine now and that brought me back to the reason we were here in the first place. 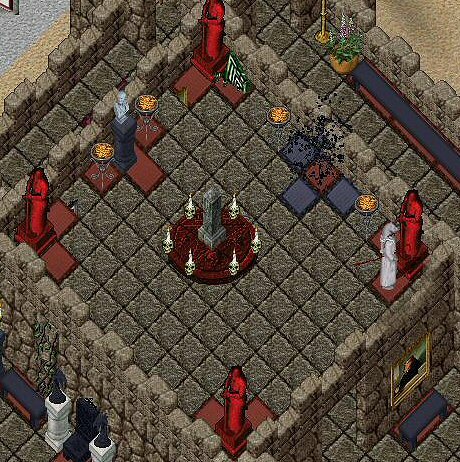 Choosing the only exit from this room besides the sandy desert I ascended the stairway to the second level, a great black stone table of a material unfamiliar to this traveler awaited. Although the stone looked as most shadow ones made by today’s craftsmen this was one piece magically created and brought here for or by a person of power that we can no longer comprehend possible. Surrounding the table are 16 Chairs that were unsecured in any fashion but totally immobile, thieves beware nothing here can be looted whilst there is no visible reason for it. Strong magics were at work to keep this place going, a banquet for kings appeared from nothing as I took seat at the wondrous dining table and music began to play loudly. As judgment told me otherwise I refrained from partaking of anything in the spell woven fare, even the Elvin green wine went untouched and that in my opinion is a sin at any time of the day. A glowing white pedistal in the room’s corner was actively throwing light fragments from within creating the illusion before me I would have bet but I was unable to disrupt it in any way. The rest of this floor had meditation benches ancient portraits a small rune library and most notably the balcony from which one could overlook Temple grounds and the stirrings of the desert below. The view as it were was uneventful if you forget the many creatures milling about, a Graveyard to fallen knights and clerics of this temple and the top of the aforementioned statue whose spear tip matched this visage point in height. Shaking my head clear I entered the southeast tower and descended its stairway to continue my unguided tour. The door had wards and refused my first attempt at entry with a field of invisible energies, thinking for a second I recalled my invitation and pulled out a small satchel from a pocket in my robes and removed its contents. A small white figurine shaped like a man was my best guess shorter then any of my fingers and quite cold to the touch, I held it tightly and tried once again to enter. A large sucking type sound filled my ears as I passed the invisible barrier and then I was inside the chamber and taking stock of its contents. A three piece Marble table the likes of which has not been seen ever in the style and direction it faced was adorned by the long lost Foxglove Flowers, this masterpiece was accompanied by tapestries which are most certainly from another land or time. These artworks were quite rare and by an artist I had heard tale of only in bards songs and old musty tomes, I will draw a sketch so you may be able to comprehend the beauty of it all. I sat for a moment in the chair that called this marble fantasy kin and once again my head got dizzy with images of what was once before……. As they approached the ruins of the temple, they could see that much work was needed. Durnik and Legato stood side by side as they began to speak, the wind picked up and howled and the sand around them swirled in a cyclone. Moments later, two large golems stood before them awaiting any command. Durnik and Legato then spoke in unison. “Rebuild it.” The golems bowed and immediately began to move the large debris and started to rebuild the temple. The damage to the temple was severe and it was weeks before the temple was even able to host anyone for a night within its walls. The brothers had returned night after night to prepare the temple and restore it. Their magic’s were fading as they spent night after night without rest, summoning their golems and restoring old items to new. It was on the 76th day that the shell of the temple had been completed, its halls had been restored, the passages rebuilt, the vault secured. Room by room the temple had been restored and its foundation re sewn. For all the work done the temple was still empty, a new throne and furniture would need to be rebuilt. Worries of another day they thought. As they sent their golems to sleep for the final time, they merged into the great chamber. Ok I was definitely tiring of these visions and very sorry I did not drink any of that wine whether it be illusion or reality, as I always say reality is a state of mind and imagination is more my cup of tea. Climbing the stone stairs once again it was time to visit the southwest side of this great keep and see what lie within. Now there are times in this realm when you come upon that one treasure you have sought for so long whether it be on the corpse of a Balron or some vendor who had no clue what power lie in that item. Then there are the times the gods themselves have brought unto us such marvels to behold; the other side of course is unnatural creations of the mentioned Balron or servant of a dark master. I don’t usually speculate due to the appreciation of the gift at hand but in this case I am sure more then a few eyebrows have risen to the question of origin. In this room lay a HUGE sarcophagus, easily twice my height and thick as the walls of this keep or better. Great chains hung on the walls behind it, whether to manipulate its covering or hang those who dare enter here I was not certain. Hoping for the latter I dusted off the lid some to see what carvings lay upon it, a large night was carved into the top and a plaque named him Lord Frederick. A small gold book on a table told the story of how Frederick the second dark lord was betrayed by poet and slain to gain the ring housing the green gem of souls, turning the pages to the end it was signed Lady Silriens in memory of a great leader and father. 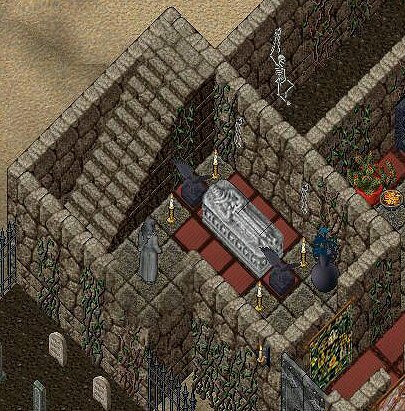 Burial chambers make me a bit uneasy ever since that run in with a lich lord in the crypts of Brit cemetery that night, but that is a story for another time. Suffice it to say I paid my respects drew a quick drawing and left without a letting dread into my mind. The next room I was drawn to visit was an alchemist dream, a laboratory that holds some of the most ancient flasks, Vials and candles made from human skulls. Items such as these have been copied over the years and the imposters are now common but the old time users of this art remember well the quality and rarity of the old alchemists tools. 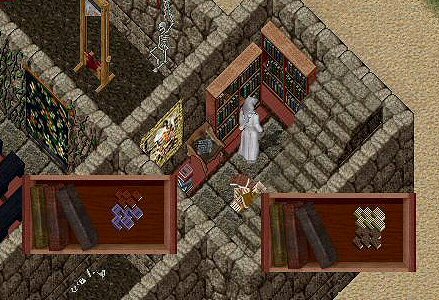 From this room you can see two skeletons hanging behind the keep, the walls that separate them from the world seem impassable I am sure dark magic’s were at work. I wondered for a second who the two decayed prisoners were and soon decided some things were better left undiscovered. The library sat in the Northeast corner of this grand keep and it was a welcoming sight to any historian or reporter as the books within held many stories and secrets not commonly told outside these walls. Many popular authors works are preserved here and waiting to be shared with others, I am going to take a moment and read to you some more of the Temples upbringing. Curiously there was another area of this house I could not access but vision penetrated the walls in certain places so that it was obvious he rooms intentions. A Torture Chamber and one not for display purposes as the blood soaked equipment and spatter walls can attest to. 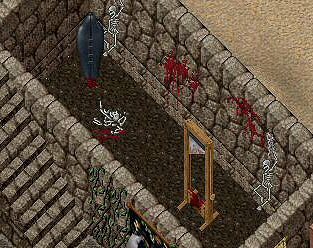 A guillotine stands against the east wall with a CLOSED Iron Maiden on the left. Does some one currently occupy this device of death? There was certainly fresh blood on the floor surrounding it but as I said no way into this chamber. An acolyte approached me wondering why my face was pressed against the stone and explained there was no way in, “not for you anyway ” he stated. Hmm.. Not for me huh, then someone can get in and out I thought to myself and I am better off not being him or her! I am sure there are ways to get in and atrocities tat you could commit against the temple that would get you inside, coming out however did not look probable. Ok as in all good stories the very best of this establishment has been saved for last, located on the second floor northwest tower is a teleporter, which will give you access to the roof. I say roof but a roof covers your house and keeps the rain off your head whilst you sleep, this is more of a shrine or worship area of sorts. 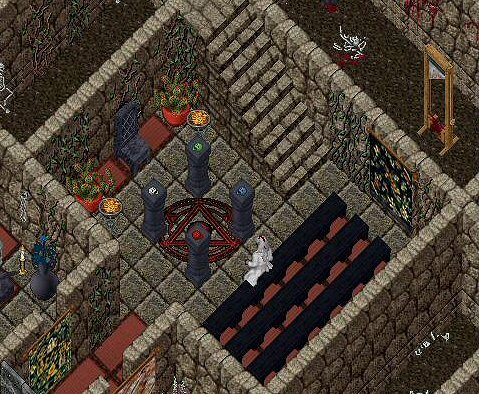 In the middle stands a decaying guild stone for the Temple of Mondain atop and altar circlet surrounded by skull candles. Four Guardian warrior statues stood watch over this place lit against the night with braziers carefully placed. A pedestal that held a pure white ivory Mondains Bust statue finish off this declaration to ToM and it’s many followers quite nicely. From up here you can spot the tops of the four corner towers and wonder at the solid black ankhs that adorn the top of each one. This house is most certainly filled with one of a kind items that are offered for you all to share at any time, houses like this remind us of a time that once was when role-play was more alive. When the creators interacted with the pawns in their game and used their powers for blessings and rewards for our long time dedication and involvement in this shard. After those musings I figured it time to find the person who runs this place and hear some of the things he would like to share with you all. 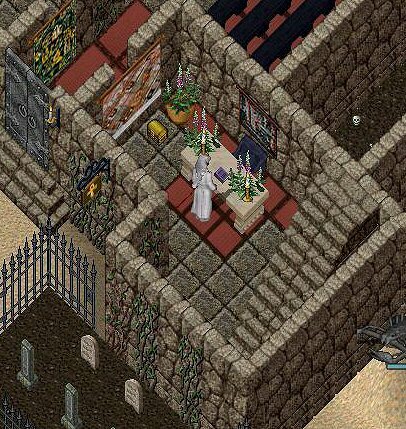 Removing myself from the roof area I walked back through the main entrance and asked for audience with Lord Meneldur High Priest Temple of Mondain, I was told summarily to have a seat and I was happy to comply. Some hours later I was awaken from my chair nap by a priest, coming to my senses I barely had time to wonder why a lower servant was not sent before jumping up to follow the hasty man. 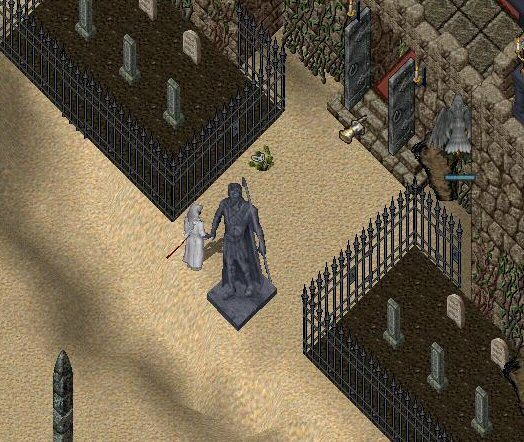 He led me back to the office I invaded earlier pulling from his pocket a small white statue before trying to cross the entryway, I did the same and went inside. Now at the desk sat a man in dark robes one who looked quite wise but the type of wisdom that you paid for in hard years, the eyes told of ages serving with every last breath and maybe even a need to rest. That lasted a second and they were full of life, the man stood smiling and offered his had as he was announced to be Lord Meneldur and some title or other that was lost in our greeting. I has a million questions for this man but he started out by apologizing that his time was short, so I picked a few I thought most pertinent and got ready with my notes. A woman brought in a tray that held many delicacies and two glasses of what I presumed to be wine inside golden goblets that gave off cold smoky vapors, now I was very happy. Taking some cheese and a goblet I nodded my thanks to this… servant.. No that did not fit she seemed more to be a mistress of the house as I watched Meneldur respect her in some untold way. As we ate and drank my host finished what he was working on at my entrance and clear his desk of the awaiting paperwork, which would be his reason for the lacking of his time. The goblet I drank from was now empty, I placed it on the table and wondered as it refilled itself magically the same mist coming forth denoting its cool temperature. The high Priest sat back and folded his arms across his chest before speaking.. Writing furiously I nodded approval at the answer and went forward.. This question elicited an exploring glance as if to divine my intentions, I must have passed inspection because he chose to answer me. After a satisfied look he sat back once more, a slight grin on that mask of illusion he wore. These lands around you are fraught with dangerous creatures and murders on your realm are quite common. Does this danger affect the Temples ability to achieve its goals? “Some may see it as a disadvantage but we feel differently, this land is where the world began it has a long history and we are honored to remain within. We enjoy the privacy that comes from the being where few men will tread without purpose and are honored to remain in our ancestral location. I knew well his feeling in this I myself prefer to mine at my Fel house its quiet and allows best production without interruption and history after all is where we all came from. 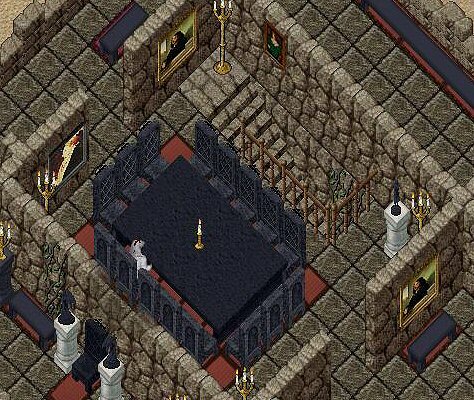 I had very much enjoyed the history of the Temple of Mondain from the library to those strange visions I experienced here, but to really know this place I would you to speak of it in your own words. The Temple of Mondain started in a smaller church close to the city of Yew and in our attempt to gain the rights to worship Mondain and be seen as cities it drew us to war with the Yew Militia. We then very successfully protected the Followers of Armageddon who we felt strongly would bring the return of Mondain, until they used unwise decisions and were eventually captured. When Mondain took over things changed slightly and he used his power to create the Black Altar and the Gem of Souls united many of the evil guilds and openly declared a campaign to reclaim all the cities of Sosaria in the name of Mondain. For years the wars raged until he finally ascended and the guild was left to Fredrick, who for a short time kept with the campaign until his sudden and mysterious disappearance. Poet then claimed the Temple of Mondain and the Gem of Souls for his own until it betrayed him and lead to his death…. or so we thought. And that is of course where I come in. A year after the destruction of the Temple I came to the ruins, and discovered the Gem of Souls in the wreckage. Everything changed from that moment, the Temple was reconstructed and I took leadership within the Temple. I was scribbling frantically to jot he details I could catch, when I finally stopped writing I looked up to see my host standing and heading toward the closed door. I guessed correctly our time had come to a close, there must be many details to maintaining such a complex and I had everything I needed to begin my project. “Thank you Lord Meneldur” I had chance to say as I began to leave.